It isn’t often that a company is recognised as the best in the world at anything in any industry. Likewise, companies are rarely lucky enough to have someone on staff who is acknowledged as the leading world authority on a subject. Elgas is fortunate enough to have both. The WLPGA and various LPG companies around the world recognise Elgas as the premier digital marketer of the LPG industry. Our SEO results are unparalleled in our field. Our pages appear in search results around the world. Our blog is routinely read in almost 200 countries every month and viewed by almost two million readers per year. Similarly, Eric Hahn is our resident expert in LPG digital marketing and is recognised as the world’s preeminent authority on the subject. Eric has been asked to speak, on digital marketing, at the WLPGA World Forums on four occasions over the last seven years and is the only speaker they have ever invited to address the Forums on this subject. Eric spoke in Bali (2012), Miami (2014), Singapore (2015) and most recently in Houston, last month. Eric also taught a course at the WLPGA Training Workshops, which were held immediately after the Forum in Singapore. This was a program where participants from around the world paid to attend. What was especially notable about this event was that the head of an Australian competitor flew to Singapore just to attend Eric’s class. In addition, many of you may have noticed that Eric is also the author of virtually all of the Elgas blogs. Our customers benefit from great content, easy to use web functionality and industry leading innovative apps. So, we are proud to say that Elgas’ websites and digital marketing are in secure hands. Elgas Australia now has a new website. New style - Elgas has taken modern design cues and has incorporated our own distinct colour theme and design style to make it uniquely Elgas. It still incorporates our company colours, but a lot less purple. Focus on function - The core online functions such as Online Order and Online Payment have been strategically placed and thoroughly tested to provide a better user experience. Thorough testing - Some of you may have noticed new pages appearing intermittently over the last few weeks. This was part of the in-depth testing procedures. Mobile navigation - The significant improvement of the mobile menu will enable visitors to navigate to other web pages on the website with greater ease. We haven’t forgotten NZ either. A new NZ website will launch in January. Astomos Energy Corporation (“Astomos”) and Elgas Limited (“Elgas”) have signed a Memorandum of Understanding (”MOU”) to collaborate on the use of LPG as a ship bunker fuel (“LPG bunkering”). The use of LPG as a ships bunker fuel is being considered as possible solution to meet the International Maritime Organisation (IMO) shipping fuels SOx limit of 0.5% from 2020. This MOU will enhance cooperation between Astomos and Elgas across all aspects of LPG bunkering including the sharing of information, research and development and collaboration in securing sites to supply LPG for ship bunkering within the Asia Pacific. Over the past few years Astomos and Elgas have developed a strong business relationship in the field of seaborne LPG trading. This MOU will strengthen the relationship between the two companies and will facilitate the expansion of this relationship into new business areas. Astomos is the world’s largest LPG supply & trading company and the largest importer/distributor to the Japanese LPG market. Elgas is Australasia’s leading LPG marketer and distributor with extensive operations in Australia and New Zealand. As you will have seen in the news reports Cyclone Debbie and its aftermath have and continue to cause severe damage across Queensland and Northern New South Wales. Our thoughts and prayers are with all who have suffered personal losses. Due to the outstanding work done by our employees and our contractors across the region the impact on Elgas’ depots and equipment has been minimal in comparison to other businesses. Similarly, work over the weekend by our dedicated employees and contractors has meant that almost all depots are operating this afternoon, albeit with minimal power and communications in some cases. The support from other parts of the business, e.g., in filling and supplying cylinders to affected areas, covering deliveries, organising for extra equipment, etc. from other areas has meant that we have been very well prepared to meet additional customer demand to assist our customers and local communities in the disaster recovery effort. The efforts by others across the business, including other branches & the National Service Centre, to take additional/emergency calls and so on has helped support and ease the pressure on areas affected and maintain service to our customers. Other areas, like Rockhampton, will be affected in the coming days as the floodwaters and rainfall continue to batter the East Coast. We will provide updates as news comes to hand. To all of those involved, please accept our sincere thanks and gratitude for your support to date. Most importantly, please take extra care to make sure you don’t put your health and safety at risk in these abnormal conditions. 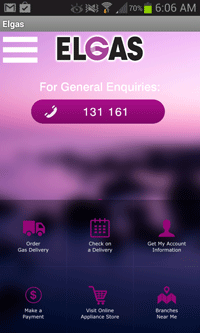 Order your LPG deliveries online to win a share of $30,000. Every time you re-order gas online and receive a delivery, between 1 February and 30 November 2017, you receive one entry into the draw for a share of $30,000! You also get bonus entries for signing up online for Paperless or Direct Debit. New Customers who sign up online get bonus entries, too. The more times you order online, the more entries you get and they roll over into all subsequent draws* until the end of the competition. Both current & new LPG customers are eligible. Our congratulations go to Elgas' own Jodie Collins for winning the 2016 Women In Industry Award in the Marketing & Communications category. What has the individual done and how has she achieved it? Jodie Collins, Brand Manager for SWAP’n’GO®, has implemented many marketing communication strategies in her 13 years at Elgas, but one of her top successes was achieved during the East-coast Kleenheat Rebrand, a project outside her normal remit. When Elgas acquired Kleenheat’s east-coast LPG distribution business in 2015, Jodie took on the entire rebranding of all Kleenheat assets across Australia – a massive undertaking to achieve given the legally required deadline of 12-months. The rebranding went far beyond standard marketing materials, including exterior steel signage, gas bottle cages, and more. To understand the scope of the undertaking, Jodie worked with the Elgas transition team to document all site locations. She also worked with various vendors to receive quotes for each required component. She then worked with national contract account managers to come up with new artwork that was satisfactory to all parties. Over 4400 gas bottle cages, scattered over 2600 sites, required new steel sign sets to be fabricated and the installation organised. In many cases, the cage doors had to be removed, signage changed offsite with power tools, then returned to the site and reinstalled. In addition, over 1200 agents and distributors in four states required Elgas rebranding – and the steel signage installation was far more complicated than it sounds on paper. Some sites had multiple signage requirements, which were carefully documented before installation commenced. Once complete, she also had to provide photo documentation of each location’s successful rebranding. One of the most challenging aspects of the project was getting third-party LPG distributors and agents to comply in removing their signage and replacing it with Elgas materials. Some did not share Elgas’ urgency or legal imperative; Jodie had to find shared incentives to persuade them to comply on time. She remained organised in her documentation and persistent in her follow-ups, staying on top of each site’s progress around the country – and by the end of the 12 month period, she had successfully persuaded every single one. What separates this nominee from the rest of the industry? For 12 months, Jodie did her day-to-day role as Brand Manager and took on this major rebranding project. Through her tireless work, the Elgas/Kleenheat rebranding was rolled out in full with all deadlines met – a huge success. Jodie’s tenacity, persistence, and tireless work separate her from others. Her readiness to take on the enormous rebranding project in addition to her work as SWAP’n’GO Brand Manager is just one (outstanding) example of her consistent willingness to go above and beyond her normal responsibilities. A proactive leader, Jodie’s enthusiasm is contagious, as evidenced by her ability to motivate third party compliance across the country. She inspires others to work their hardest, and her diligent work ethic and organisational skills are unparalleled. Good News for NSW Resident pensioners who use LPG. The state government has extended the annual $90 gas rebate to qualifying LPG users. Previously, the rebate only applied to natural gas users. The program kicked off on 1 July 2016. Order your LPG deliveries online to win a share of $25,000. Every time you re-order gas online and receive a delivery, between 1 February and 30 November 2016, you receive one entry into the draw for a share of $25,000! Nicolette Hinson - General Manager Business Development and Strategy has just won the Business Development Manager of the Year, as awarded by the Women in Industry. Nic has made a significant contribution to growing Elgas' business since she became General Manager for Business Development and Strategy in 2011. She is the key driver of business development and is responsible for identifying and developing new business opportunities for commercialisation. Nicolette has consistently achieved growth in new focus areas through her excellent technical ability, solid commercial understanding and leadership. Under Hinson's leadership, Elgas has significantly grown its liquefied natural gas (LNG) stationary energy business with revenues increasing some 2500 per cent since 2011. Hinson drove the signing of two major customers and expanded the sales personnel team to grow the LNG business in Queensland and New South Wales. She has worked across both Elgas and BOC to support the development of the customer offerings for this new market and played a vital role in preparing market-based information that supported the investment of BOC's new LNG production facility in Queensland. Hinson also developed a business case for the implementation of a new Stargas operation site in Brisbane to strengthen Stargas' position and capability in the region. This recommendation was approved by the business with the new site opened in 2013. It has helped Elgas win new industrial and LPG accounts in the SME Business area. Elgas, Australia’s largest supplier of LPG and Autogas, welcomes the Victorian Government’s announcement today of a $60,000 investment towards a demand study for an LPG vehicle production plant in Geelong. Cameron Ure, Elgas’ General Manager for Unigas, said the investment is the first positive signal for an industry hit by a perfect storm. “The recent Holden and Ford manufacturing closures that have shutdown Australia’s only locally-produced LPG vehicles, together with changes in government policy, have been compounded by the growth of new diesel vehicle purchases that accelerated the decline in LPG aftermarket conversion centres,” said Mr Ure. “On road testing and research tells us that Autogas saves motorists money and reduces emissions - all without compromising vehicle performance,” said Mr Ure. The Australian Autogas industry needs critical government support to leverage the $3 billion investment in current infrastructure and a network of more than 3,000 refuelling stations. The Victorian Government’s commitment to ascertain the economic and technology benefits of the current and future LPG vehicle market provides a new opportunity to reinvigorate a high value industry. “Not only do we have a willing industry ready to work in partnership with government to identify a future direction, Australia has an abundant supply of LPG that is immediately available to support this industry as it responds to market demand. “Reinvigorating the new and retrofitted Autogas small and heavy vehicles market in Australia will provide a significant boost to the regional skilled workforce, and reduce vehicle emissions by 15%. “We welcome the Victorian Government’s partnership with the industry to identify solutions that deliver efficient and effective economic benefits. We will work diligently to identify new innovative technologies that will deliver substantial benefits to industry and the community,” said Mr Ure. Elgas, in partnership the Victorian Government, and strategic partnerships with Gas Energy Australia and the VACC, are committed to arresting the downturn of a significant and viable Australian industry. Elgas looks forward to the results of the Victorian Government’s study and future support from the Australian Government, as the economic opportunities are realised. Elgas has now finalised the purchase of Kleenheat’s Liquid Petroleum Gas (LPG) portfolio in Victoria, South Australia, Queensland, New South Wales, ACT, and Tasmania. This sale includes the transfer of all of Kleenheat Gas’ customer and supplier lists, contracts and assets associated with the company’s LPG distribution business in these states. Elgas now has the privilege of being the new supplier for most Kleenheat customers in these states. We have worked with Kleenheat to make the transition to Elgas as simple and easy as possible. If you are one of these customers, a new Elgas account has already been created for you so you can continue without interruption. You will also receive a letter with your new Elgas account number. Welcome to Elgas! Please note that existing Elgas customers are not affected by this arrangement. Following on from our announcement in April this year, Elgas is pleased to announce that it has today received clearance from the ACCC for the purchase of Kleenheat’s Liquid Petroleum Gas (LPG) portfolio in Victoria, South Australia, Queensland, New South Wales, ACT, and Tasmania, subject to divestment undertakings. John Evans, Managing Director, Elgas, stated today: “We are indeed pleased to have been able to receive clearance from the ACCC today. This acquisition supports our strategy for future growth, and is the result of a great amount of effort by the teams both at Elgas and Kleenheat, to enable this purchase to proceed”. Elgas will be divesting parts of the Kleenheat business in VIC, ACT and NSW, to Origin Energy and Supagas NSW. These will occur at the same time Kleenheat completes the transaction with Elgas. Elgas joined with BOC in supporting the new Be Gas Wise helium safety campaign. This BOC initiative is designed to make sure people are aware of the dangers of inhaling helium gas. Please visit the Be Gas Wise Web Site, read the supporting blog -- Helium Balloon Gas Safety – Don’t Be a Daffy Duck -- and watch the video. Congratulations to J. Ihle, our Grand Prize winner, and all of the previous monthly winners. Also, a big "THANK YOU" to everyone who participated in the competition. Thank you to everyone who participated in our annual customer satisfaction survey. The results will help us to direct our continuous improvement efforts. The winners of the $1,000 gift voucher were Mr & Mrs IJ Ridley from NSW. Congratulations! If you are a customer and did not receive an invitation to complete the survey, it's probably because we don't have your current email address on file. Please update your email address if you wish to participate in the next survey. In our continuing effort to provide Effortless LPG™, Elgas now has convenient online sign up for Direct Debit payments. Your choice of EFT or credit card. No paperwork required. The Senate passed the Clean Energy Legislation (Carbon Tax Repeal) Bill 2014 on 17 July 2014. This bill repeals the Clean Energy Act 2011, with effect from 1 July 2014. At the recently completed 2014 UNIGAS Enterprise Forum, Unigas used the opportunity to raise money for Camp Quality. This year’s event raised $50,000, bringing the grand total to over $500,000 since UNIGAS began their support, back in 2004. This contribution is important to Camp Quality and constitutes a significant portion of their annual fund raising activities. Elgas Limited has recently signed an agreement to purchase Kleenheat’s Liquid Petroleum Gas (LPG) portfolio in Victoria, South Australia, Queensland, New South Wales, ACT, and Tasmania. The sale is subject to clearance from the Australian Competition and Consumer Commission (ACCC) which is expected to take a number of months. Throughout the purchase process, Elgas continues to be committed to ensure business as usual, providing a safe and reliable service to its customers. At this time no further details can be confirmed in relation to the proposed purchase. Elgas is please to annouce the availablility of our new smartphone app for iPhone, iPad and Android devices. Now you can order, pay and manage your LPG with our new Elgas EasyApp™. It’s a convenient easy-to-use app and it’s FREE from the Apple or Google Play Stores. Find out more! Order your LPG deliveries online to win a share of $10,000. Every time you re-order gas online and receive a delivery, between 1 February and 31 July 2014, you receive one entry into the draw for a share of $10,000! The more times you order online, the more entries you get and they roll over into all subsequent draws* until the end of the competition. Both current & new LPG customers are eligible.